Don’t be alarmed. The pace and demands of present day society often deem messy things as needing improvement or adjustment and thusly, not residing within a space of their full potential. Right now is not one of those occasions. What’s offered by Peterson in this brief bit of disclosure alone, is more than a fair instigator for listener reticence. Yet, turn things around and dive in, knowing the album isn’t championing play-by-play perfection, and that is precisely where the beauty reveals itself. Interestingly enough, timing – and not just within instrumental execution – is an aspect of Collective Memory that greatly influenced the shape of Peterson’s composer mindset. 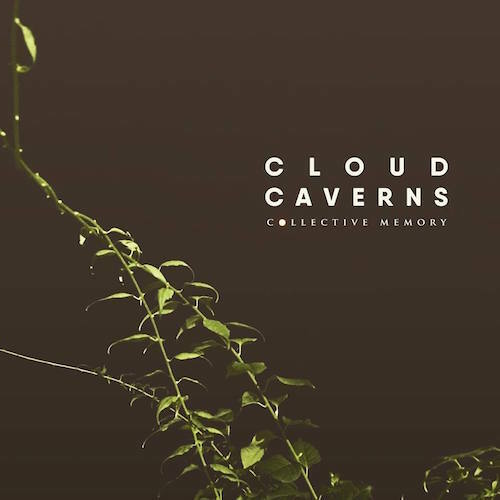 Changes of both the grand and permanent variety were afoot for Peterson during the making of Holy Gloom and consequently, this meant changes for Cloud Caverns. A somewhat uneven ratio of writing for Collective Memory happened before and after Peterson and his wife moved from the shores of Long Island, NY down to Tennessee, right on the tails of their newly begun marriage. Summarized in theme, the album addresses feelings of estrangement and beginning anew but, that doesn’t translate to one-way directionality – happy to sad or vice versa – for Collective Memory’s emotional connotations, despite having a somewhat inherently chronological foundation built into the songs’ stories (“I Do,” “Home,” “Chrysalis,”). The prominence of acoustic guitar leaves instrumentation taking a more humble, less unconventional role than on the prior record and creates a much clearer folk and confessional-style core than before. Such a decision leaves all the more room for internalization of Peterson’s stories and performance, which bear the weight of Collective Memory’s character. Still, even though there are fewer exotic bells and whistles found on this album, Peterson’s mixing and Bouza’s mastering frame the minimal tools used with plenty of texture. That’s not to say that much has been corrected in the vein of sounds recorded – as explained earlier, Collective Memory is an exhibition of unforced release. Nevertheless that doesn’t mean listeners are in for 11 tracks boasting the same guitar and drum sounds across the board. Less commonly addressed points of influence like mic placement, gain (volume) levels, and inclusion of silence and ambient noise, are crucial to this record. When room style plug-ins and effects like delay, reverb, and flanger are brought into the picture, (“Human Nature,” “No Name on the Hill,”) they serve as supporting figures for textural impact, rather than the sole influencers upon any track’s individual meaning. The narratives throughout the album slide between frank vernacular and lyrical panache. All the same, even in cases of the former, there’s something refreshing about an artistic work that reaches out with the voice of an everyday individual. (Tell me what makes you feel, what makes you tick / what makes you ill, what makes you scream?) Beyond these specific examples, an aversion to lyrical convention by way of asymmetrical verses and non-rhyming lines (Snowy mountain hills / we were jammed like sardines in a can / When we knew, it couldn’t go on like this) is another way Cloud Caverns manages to retain a ribbon of the avant-garde, without distorting Peterson’s objective for the natural. The most poetic coincidence of Collective Memory lies in how its power to affect is most felt when its inexact elements are not locked under a lens and dissected under separate examination; instead taken as they come and mirroring the band’s creative decision not to excessively scrutinize. While Holy Gloom referenced true life experience, its primary fuel sought out “fantastic imagery” to carry its messages. Collective Memory, by contrast, presents as a far less metaphorical champion – both in its sonic delivery and in its stories of emotions, personal vulnerability, and transparency; all bundled under a title that could not be more apropos. Much like an impressionist painting, look too closely and what’s there seems like a haphazard effort. It’s only after stepping back to notice it all at once that each messy stroke morphs into a beautiful work of art right before your eyes. Collective Memory is due for independent release on 4 December 2016. Single, “The Colorless Rebellion,” is currently available for purchase through Bandcamp. Rock ’til you drop with Dinosaurs in Vietnam on Black Friday!